Update, added both those things. Should be good to go now! Fixed Multiverse-NethePortals world linkages for netherportals and endportals. This should prevent players from becoming stuck between worlds and continuously spewing errors to the console. Fixed exploit with Ender Dragon Eggs. They no longer duplicate when being put in portals. Instead they are destroyed. Wow thanks for all this work and keeping us afloat wd! Two days ago I fixed quester quests, unfortunately they are re-broken every time we boot up. I've posted a message on the author's page so hopefully he'll fix it. Today I fixed minigames countdowns. Now all minigames which rely on countdowns should function correctly again. Thank you wd, you're awesome! Then gather all the items you want to add as drops in your inventory. This would set the durability of item 0 to be between 50% and 70% (inclusive) each time it drops. Would set the drop rate of item 0 to 10%. 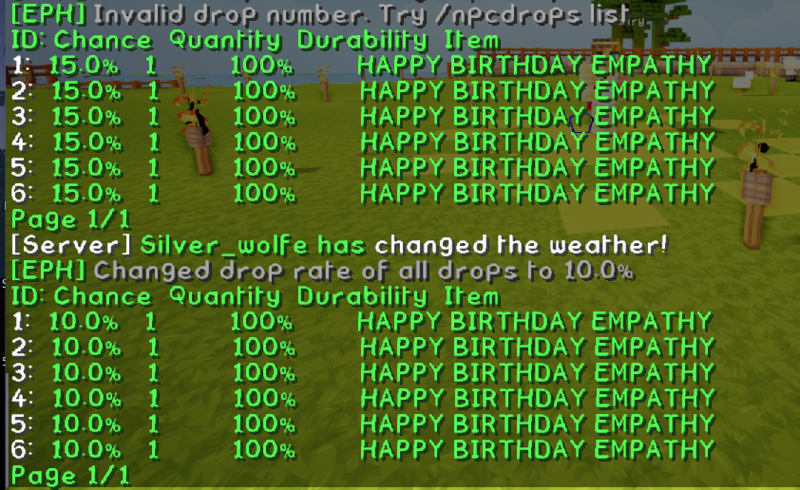 Would set the drop rate of all the items the npc drops at the same time. Protip: you can use -1 in setamount and setdurability to do all items at the same time also! Durability and quantity cannot accept decimals. Just FYI /npcdrops setrate 0 10 works and -1 doesnt work to edit all. Is it possible for a player to use silk touch to pick up spawners on this server? If so, is the 'SpawnerTransformPermision' mentioned in the initial post usable by players? Nope, no picking up or changing the nature of spawners. Too OP. I know you're busy but I was wondering if you could consider adding a bulk load of items on NPC's instead of holding each one separately? Like maybe all items in your inventory? Some NPC'S at EMA have a lot of items and all of them, or the majority, have turned to AIR and must be re-added. Emily spent half an hour re-loading the complete math dictionary on PaulDirac and AlbertEinstein only for the drops to be reset to AIR again the next day. When I went to check after she said she was done I found the NPC's not there, so I am not sure if it was an NPCdrops issue or a Citizens glitch. Doing /citizens reload brought the NPC's back but the items were AIR. Emily has agreed to re-add them all but it would really help if we could add a bunch at once especially since there are other features in the plugin to bulk edit once they are loaded onto the NPC. Would this be possible and how hard would it be to do? Thanks!